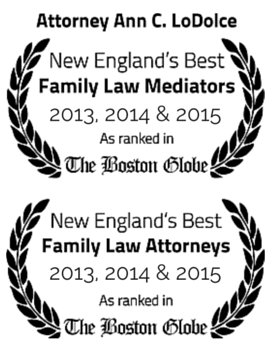 In Massachusetts alimony or spousal support is determined by the needs of the dependent spouse and the earning capacity and ability to pay by the non-dependant spouse. Attorney Ann LoDolce has extensive experience representing men and women in divorce where spousal support is an issue. The types of temporary alimony, bridge the gap alimony, rehabilitative alimony or preset periodic alimony or lump sum alimony is determined, in part, by the earning capacity of the dependent spouse. Factors considered are the education, length of time out of the workplace, any vocational skills, childcare needs, and other factors that could affect the dependent spouse’s ability to earn income. The type of alimony awarded also depends upon the length of the marriage, age and health of the parties and need of one spouses ability to pay the other spouse. Factors for terminating alimony or spousal support can include remarriage, gainful employment, inheritance, or other factors affecting the dependent spouse’s ability to support his or her self.